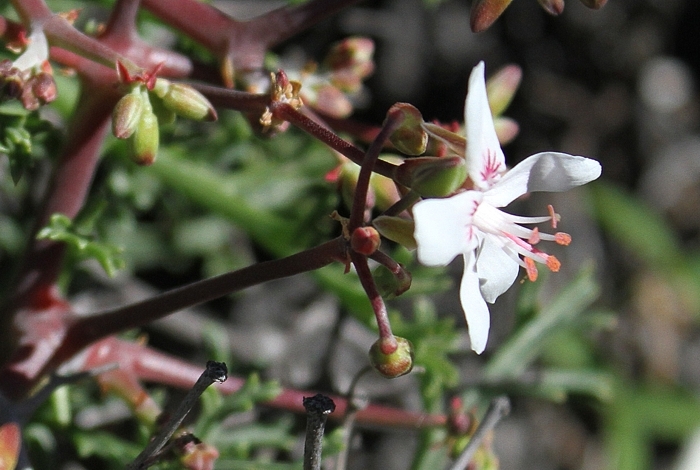 Pelargonium crithmifolium J. E. Sm. Icones Pictae Plantarum Rariorum 1 (1793) 3, t. 13. 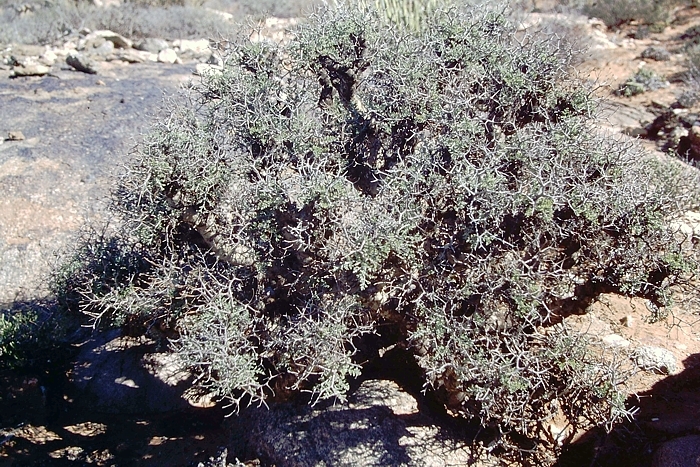 Erect, branched stem succulent, up to 1.5 m high, stems thick, fleshy and knobby, with yellowish green bark, sometimes peeling. Fleshy, pinnately divided, 5-12 x 2-8 cm, apices of pinnae irregularly toothed, margin slightly pubescent. 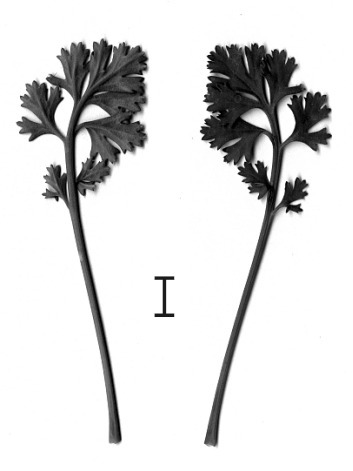 Petioles channeled on the upper side. Stipules small, ovate, membraneous. Inflorescence much branched, borne on the tops of branches, peduncles persistent, initially reddish, becoming grey-brown and thorny with age. Pseudo-umbels several, each with 4-6 flowers. Pedicel 1-2 cm. 5, reflexed. Hypanthium 4-6 mm. White, posterior ligulate to spathulate, with red markings, crimped at base, with ears, 10-12 mm long, anterior three 8-10.5 mm long, neither crimped nor marked. 5 fertile, two slightly longer, 9-10 mm, three 7-8 mm. 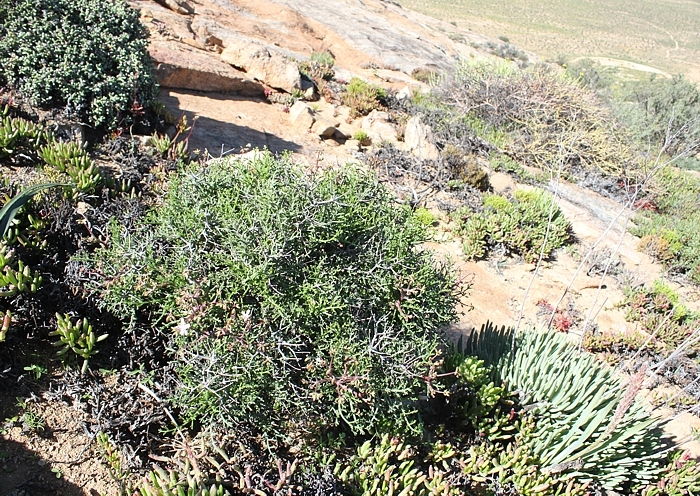 Anenous Pass, N Cape Province, in August 2014 after substantial autumn rains, a respectable shrub just before bursting into full flower. The Pass is interesting not only because of the incredible views but also because so many pelargoniums grow here: P. oblongatum, P. karooicum, P. echinatum, P. pulchellum to name a few, as well as numerous succulents. A true methuselah growing in the plains ~30 km S of Eksteensfontein in the Richtersveld, N Cape Province. 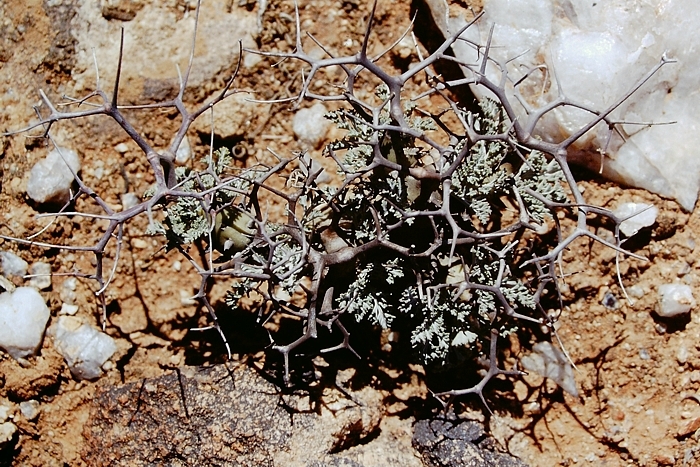 This is a very dry landscape, and in 2003, when the photo was taken (as well as the one of the plant on top of this page), the rains were scant and the leaves consequently very small. 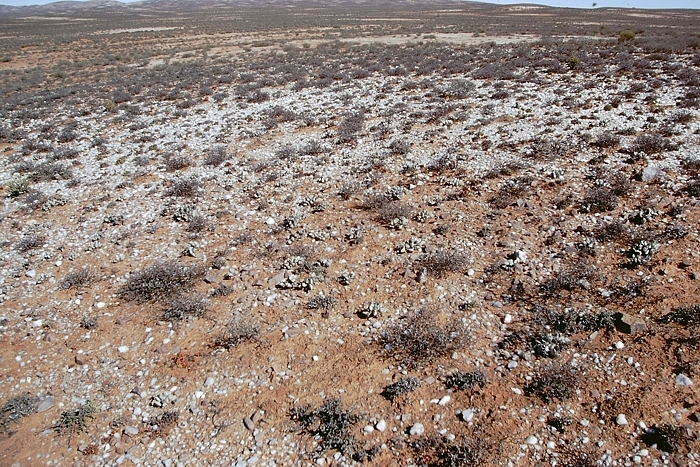 The plains around Eksteensfontein are a real paradise for an amateur botanist. 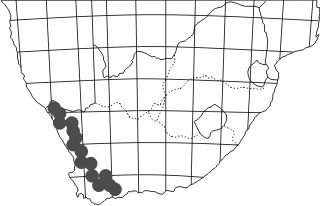 There are still areas of the Richtersveld that are extremely difficult to get to and remained botanically pretty unexplored until about a decade ago. At the very southern end of its distribution in the Hexriviervallei, P. crithmifolium shrubs grow to huge proportions: easily up to 1.5 m tall and 2 m wide, entirely covered with flowers in the midst of the flowering season. 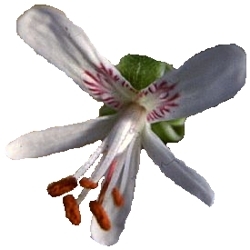 For a key to the species in the P. crithmifolium group, see the P. paniculatum page.